In today’s environment, as manufacturing companies strive to thrive and achieve growth, the power of Industry 4.0 is becoming real. Industry 4.0 changes the rules of the game for manufacturing. By leveraging Industry 4.0 technologies, manufacturers are able to keep costs down, drive productivity and become more competitive and lead the change. As a pioneer and leader in Industry 4.0 implementation, Bosch Rexroth is well positioned to help manufacturers adopt the Industry 4.0 approach and navigate change. Bosch Rexroth is driving the next industrial revolution as both a lead operator and lead supplier of Industry 4.0 solutions. With a huge automation portfolio and production experience from its own plants worldwide, it offers leading automation and manufacturing solutions – from single piece to high volume production. “At Bosch Rexroth, we are leading innovation by example. Starting within our own organisation, we are mastering the processes and products that drive connected manufacturing solutions,” said Bosch Rexroth. Alongside its role as pioneer user and supplier of Industry 4.0 solutions, Bosch Rexroth is expanding its wide-ranging offer of qualifications for Industry 4.0 with additional modules by providing training courses, training systems and modern media on the topic. The package also includes factory tours and consulting workshops that are designed to come up with customised innovative implementation for companies. Bosch is active in the areas of connected logistics, connected manufacturing and connected autonomous and collaborative systems. As a result, the diverse knowledge, as well as the numerous experiences of its experts, can be optimally utilised in these three areas. With the goal of creating a uniform international manufacturing network and thus connecting both its own and the plants of its Industry 4.0 customers worldwide, Bosch develops integrated, networked industrial solutions for manufacturing, logistics and assistance systems for robots and logistics vehicles. 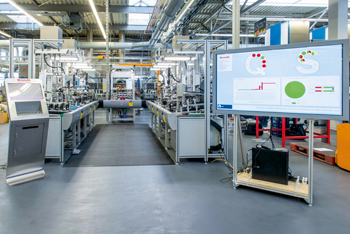 Bosch Rexroth is exploring the capabilities of connected production systems in its own plants and with those of the Bosch Group in numerous pilot smart manufacturing projects, where current Bosch Rexroth drive and control technologies are used. “Our manufacturing engineers are testing our products and solutions in a daily environment from a user perspective. We incorporate their insights directly into our development specifications,” the company said. With connected automation solutions from Bosch Rexroth, manufacturers will be able to quickly implement customised Industry 4.0 concepts economically – whether building up new lines or upgrading existing facilities and manufacturing systems, it added. “Building up new lines is always a challenge – technically and organizationally. But it’s worth it,” the company said. One example is the practical application of Industry 4.0 at the new build-up production line at Bosch Rexroth’s plant in Hamburg, Germany. Without any modification of the machine, it assemble more than 200 different hydraulic valves on one multi-product line. The result: flexible and economically efficient assembling that yields 10 per cent more output and a reduction of stock by 30 per cent. According to the company, existing machines can often be incorporated into industry 4.0 at a less cost. “It’s a solution we accomplished at our Lohr, Germany, production facility,” it said. The challenge was to manage 200,000 different product variations while producing small batch sizes. The result: it upgraded the facility to become a fully connected shop floor with high transparency and zero setup time in a paperless production environment. “Together with our extensive industry and application know-how, we can help companies integrate Industry 4.0 into their production and manufacturing systems. Let us turn the future into reality,” the company concluded.